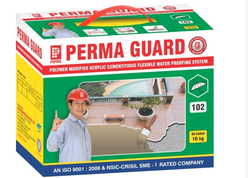 Perma is manufacturer of Waterproofing Products in India since 1997, We having Perma Waterproofing Chemicals for Waterproof your home. Our Waterproofing Construction Material is available in Liquid and powder form. We offer Waterproofing Chemicals For roof & Terrace with good quality. We also manufacture Plasticizer Waterproofing Powder , Admixture Waterproofing Chemicals , Waterproofing Construction Chemicals for Quick Setting , Crack Waterproofing Tape For Joints , SBR Polymer Waterproofing Chemical , Liquid Crystalline Waterproofing , Waterproofing Butyl Tape , Construction Waterproofing Materials for your construction. All Construction Waterproofing Chemicals and Construction Waterproofing Products are available with us with the brand name of PERMA. We provide an unmatched range of Waterproofing System products which are broadly applicable in various waterproofing and resistive applications. We manufacture these using the premium quality and environmental friendly raw materials that are sourced from trustworthy vendors in the market. These are available in demands of our esteemed clients and at best economical prices. Apply one coat of plaster and cure for 7 days. Apply one coat of Barrier coat and immediately complete the second coat of plaster and cure normally. Stop the use of upper floor toilet till the dripping stops. Remove the plaster or scrape the concrete. If the surface to be applied is concrete only which is sound then use the surface directly. Apply two barrier coats and plaster the surface immediately. On the prepared terrace surface apply two barrier coat or one barrier coat followed by Plaster or IPS. Clean the rods and apply two barrier coats. 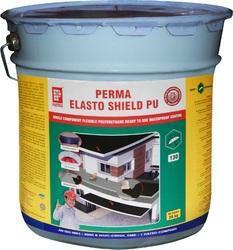 1litre Perma Shield +1 kg cement will give a coverage of 30-35 sq.ft./coat/Ltr. 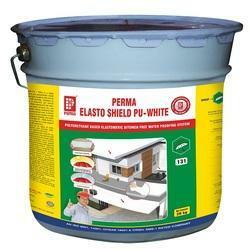 Perma Shield is supplied in 500ml, 1 liltre, 5 litre, 10 litre, 25 litre and 100 litre pack. 12 months from the date of manufacture is stored in a cool, dry in original packing. We Manufacture Waterproofing Liquid For Concrete. LIQUID INTEGRAL WATERPROOFING COMPOUND FOR CONCRETE AND PLASTERS. Plast-O-Proof is an integral waterproofing compound, ideal for use with both Concrete and Plasters. Plast-O-Proof is based on specialized surfactants and synthetic resin which impart superior flow and cohesive properties in concrete and mortars. Use of integral waterproofing compounds in concrete and mortar is one of the precautions taken to achieve a waterproof concrete or plaster. Durability is increased due to air entrainment. Segregation bleed and thereafter honeycombing is prevented. Surface finish of concrete and plaster is improved. Attacks by Sulphates and chlorides from ground water in coastal areas is well tolerated. Our clients can avail from us an extensive array of Waterproofing Powder which are available in different sizes as pockets and that meet the individual requirement of our clients in the best possible manner, which are commonly used in cleaning agents which are killing bacteria and clean at the same time useful in achieving foolproof waterproofing on the variability of building structure weather new or old. Perma Coat & Seal is UV resistant hence suitable for coating on bridge decks and girders for preventing carbonation of reinforcing steel. 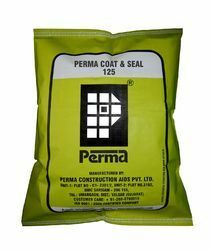 Perma Coat & Seal is single component product which needs only on site addition of water. Hence It is user friendly and easy to apply. The product has very strong adhesion to variety of building surfaces. Perma Coat & Seal is highly effective in water proofing, and does not leave the surface as it allows the concrete to breathe normally. THERMOPLASTIC ELASTOMER WATERPROOFING TAPE FOR OPEN JOINTS IN STRUCTURES. Perma Expa Tape is a Thermoplastic Elastomer based tape available in suitable lengths for covering expansion joints, isolation joints, weak construction joints and joints between two dissimilar building materials such as concrete and stone work or concrete and steel/PVC pipes etc. PRIMARY USESFailed Expansion joints where in the sealant has failed either in or cohesion or adhesion, cause severe leakage problem in the buildings and these leakages start corroding reinforcing steel bringing down the life of the structure drastically. Similar phenomenon is observed in the joints of dissimilar building materials such as joints of concrete with steel/PVC pipes, junctions of RCC and stone slabs/blocks, many such junctions in sewage and water treatment plants, building roofs etc. Perma Expa Tape offers a permanent solution to these nagging problems. It not only water proofs these weak areas but also helps in maintaining their aesthetics and life of the structure. We manufacture polyurethane based waterproofing membrane chemical, PU based waterproofing Product . its PU Elastomeric Waterproof Coating based used in Polyurethane Modified Elastomeric Waterproof Coating. its suitable for use both on horizontal as well as vertical surfaces for Terrace elastomeric Waterproofing Coating , Waterproofing Solutions For Roof , polyurethane waterproofing coating. Perma Elasto Shield PU is a single component VOC compliant, ready to use, liquid polyurethane based waterproofing membrane. It is composed of a blend of polyurethane and selected hydrophobic fillers, minerals, gelling agents and special stabilizers. It cures by reaction with humidity, maintains its elasticity and is suitable for use both on horizontal as well as vertical surfaces. Upon curing Perma Elasto Shield PU forms a tough and flexible membrane which is resistant to a wide range of temperatures. 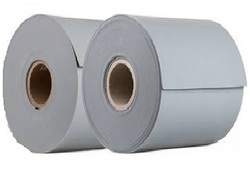 Packaging Details: Perma Elasto Shield PU is available in 4 KG & 20 kg. packs only. We supply Waterproofing Coatings Product for construction in Indai. We manufacture polyurethane based waterproofing membrane chemical, PU based waterproofing Product . its PU Elastomeric Waterproof Coating based used in Polyurethane Modified Elastomeric Waterproof Coating. its suitable for use both on horizontal as well as vertical surfaces for Terrace elastomeric Waterproofing Coating , Waterproofing Solutions For Roof , polyurethane waterproofing coating. Perma Elasto Shield PU is a single component VOC compliant, ready to use, liquid polyurethane based waterproofing membrane. It is composed of a blend of polyurethane and selected hydrophobic fillers, minerals, gelling agents and special stabilizers. It cures by reaction with humidity, maintains its elasticity and is suitable for use both on horizontal as well as vertical surfaces. Upon curing Perma Elasto Shield PU forms a tough and flexible membrane which is resistant to a wide range of temperatures. We have Waterproof Elastomeric Coating for Terrace & Waterproofing Material for Terrace , Water Proofing Chemicals for Roof , Construction Waterproofing Powder, Waterproof Crystalline Based Coating Products. Perma Eazee Coat is used for waterproofing all types of RCC surfaces such as roofs, chajjas, parapet walls and external walls. Asbestos cement sheets roofs can also be waterproofed using scrim cloth at the junctions, overlaps and J- bolts as reinforcement.As a damp proof course applied under the first layer of bricks or blocks in masonry works. ADVANTAGESPerma Eazee Coat can be applied directly from the can.Perma Eazee Coat cures & give a permanently flexible and resilient surface resistant to a wide range of temperatures.No cleaning solvents are required and can be washed off with water when it is still wet.Single component and easily brush applied.Can be used on wet surfaces and during rainy season.Mechanical damages to the membrane can easily be repaired by spot application.The membrane allows the concrete surface to breathe.Seamless application no joints are requried. Packaging Details: Perma Eazee Coat is available in 500 gms, 1.5 kg, 5 kg, 10 kg, 15 kg & 50 kg packs. Our Perma Guard is a polymer modified cementations Waterproofing Coatings with a very wide scope of applications in water proofing and corrosion inhibition situations. Our Guard is a two component material which forms a flexible reinforced membrane upon curing. Can resist up to 10 bar water pressure. Sealing cracks in asbestos cement sheets and sealing bolt openings. Packaging Details: Perma Elasto Shield PU is available in 4 & 20 kg. packs only. Looking for Waterproofing Products ?